Parris v Carney: Who's got the best skills & celebration? 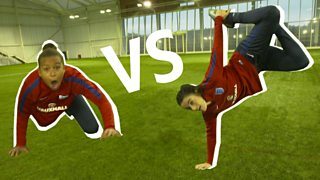 England internationals Nikita Parris and Karen Carney go head-to-head in our challenge to see who's got the best skills and celebration. WATCH MORE: Lingard, Butland & Maguire take on our skills challenge.